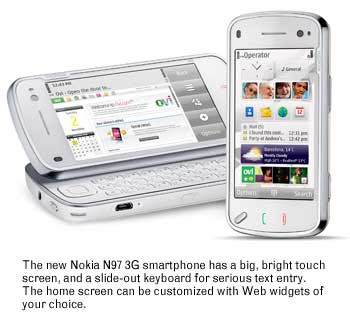 Nokia Tuesday released its high-end N97 3G smartphone, combining a touchscreen with a tilted 3.5-inch display, a full QWERTY keyboard, and inviting a straight-up comparison with Apple's trend-setting iPhone. The handheld combines advanced hardware features with a bundle of services, including assisted GPS, which are intended to merge the device tightly with location-based applications, social networks and the mobile Web. The company also unveiled an improved Nokia Maps service and a new Nokia Messaging service, both part of its Ovi online services set.